I really do enjoy analytic writing, which goes a long way in explaining why I enjoy practicing appellate law so much. But it's the writing part of writing that I enjoy, not the formatting part. The formatting part drives me crazy. I expect that, had I come of age in the time before personal computing, I never would have become a lawyer, or at least not an appellate lawyer. The same is likely also true if I had come of age before styles became so incredibly useful in word processing. Without styles, I would not survive. This post and the last two posts have been about how to take some of the work out of the formatting side of writing so that you can have more time to spend on the writing side. Using AutoCorrect to create your citations and then marking your citations for an automatic table of citations are incredibly useful, I believe. But they are not critical. I believe, however, that styles are critical for a clean, well-formatted brief. Otherwise you're spending a ridiculous amount of time cleaning up all of your paragraphs so that every page looks uniform and orderly. Or you're leaving other people to do the formatting work, which make you "that person." You don't want to be "that person," do you? So what are styles? 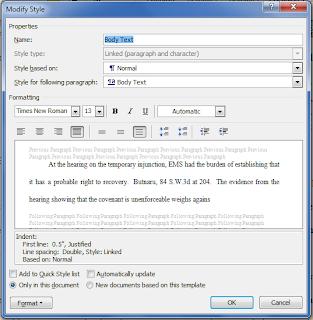 Styles are a way you can tell MS Word (or any other word processor) how every kind of paragraph you write should look. Most of your paragraphs will look more or less the same. For example, most of your paragraphs may be one-half-inch left indent on the first line, double spaced, justified, 13-point Times New Roman. I have a style, "Body Text," that I click on for every paragraph that is supposed to be formatted like that. I also have a style called "Block Text," which is one-half-inch left indent for the whole paragraph, one-half-inch right indent for the whole paragraph, single spaced, justified, 13-point Times New Roman, with a 13-point space at the end of the paragraph when the next paragraph is a different style. Then there's "Body Text No Indent," which is identical to "Body Text" except that (you guessed it) the first line is not indented. The list goes on. The point is that, whenever I'm writing a brief and want to block quote something, I can just click on the "Block Text" in my styles pane, type the text I'm quoting (or paste it), and all my formatting is done for me. For the next paragraph, I click on "Body Text No Indent," and I plug in my citation. For the paragraph after that, I click on "Body Text" and keep on writing. I have condensed multiple changes to the settings for each paragraph into three clicks. Also, I know that the block quote I just typed is formatted exactly the same way as every other block quote in the brief. The same is true for every "Body Text" paragraph and every other paragraph that has been assigned a style. I'd like to offer one other way that styles are useful. When you are done with writing a brief and you're doing your final check to make sure that everything looks that way it should, do you have to spend time looking for headings sitting alone at the bottom of a page or extra line breaks from the last time you corrected that but then everything got changed in the last round of edits? Not to rub it in. Hopefully by now I have convinced you that it is in your best interest to be using styles. Now let's move on to how to set them up. As you might imagine, styles are rather open-ended with how you set them up. So there's a lot worth learning about styles that I cannot cover in a short post. Once I give you the basics, I encourage you to play around with them and spend some time googling what the different options are. To set up your styles, you'll need to set up a document that will be your starting document for all future briefs. 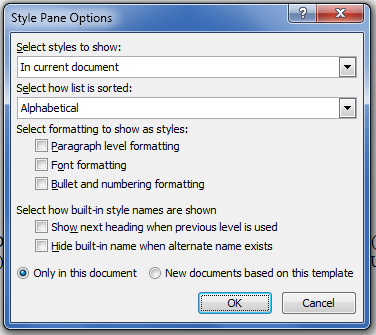 If you know how to create templates, you might consider creating one and setting up the styles in that template. Otherwise, just create a file that you'll copy each time you're ready to write a new brief. I recommend that you start with an old brief that has as many of the different kinds of paragraphs that you expect to be using already in it. For example, if you have an old brief that has block quotes to cases, block quotes to statutes or trial testimony, numerous footnotes, and perhaps a bulleted list or two, open that up. It's usually easiest to define styles based on existing text. Now that you have your old document open, look for the styles portion of the Home ribbon. Now, click on "Options..." at the bottom right. I recommend that you choose "In current document" under "Select styles to show" and "Alphabetical" under "Select how list is sorted." But that is more of a personal choice. Once you've chosen how you want things displayed, click "OK."
Now let's set up some styles. First, if you are using an old document to set up your styles, put your cursor in a paragraph for the first style you want to use. It's probably best to start with what will be your standard paragraph text. Microsoft has a number of pre-defined styles. Because of how open-ended styles can be, the settings for Microsoft's styles are almost certain not to be what you want them to be. But you can very quickly change them to be exactly what you want them to be. To modify existing Microsoft styles, go back into options, and select "All styles" under "Select styles to show." Then, click "OK." Find a suitable style name. 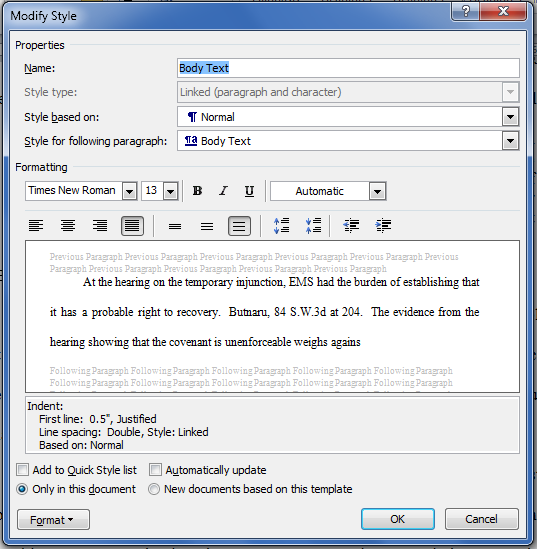 (I use "Body Text" for my standard paragraph style.) Hover your mouse over the name of that style, and you will see a drop down button to the right of the style name. 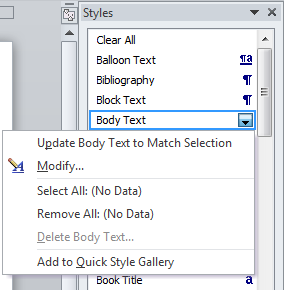 Click on the drop-down, and select "Update Body Text to Match Selection." Voila! Your first defined style. Wasn't that easy? No go through your document, find each of the different paragraph styles, and identify them appropriately. (Hold off on your headings for now, though. Styles for headings are worthy of their own article, to follow. They're complicated, but they're worth it.) If you don't like any of the names for Microsoft's pre-defined styles, you can create your own. Click on the "New Style" button at the bottom left of the style pane. Under "Name," type in your desired style name. The rest should be set up based on the paragraph your cursor is currently in. 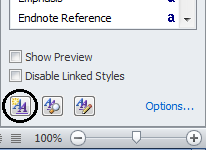 Make any changes you feel necessary and click "OK."
Once you have defined all of your styles, I recommend going back into options in the style pane and selecting "In current document" under "Select styles to show." That removes a lot of the clutter for the style pane. Now that you have your styles set up, using them is rather easy. If you have a paragraph in your brief that hasn't been marked, simply put your cursor anywhere in the paragraph and then click on the style. If a paragraph is incorrectly formatted, just put your cursor in the paragraph and click on the correct paragraph style. 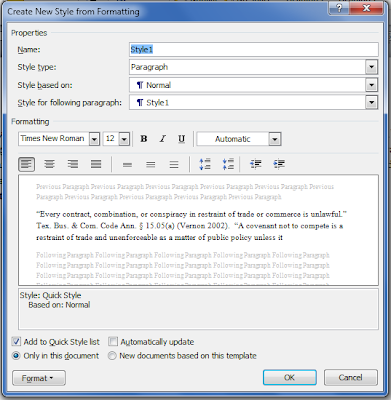 Now you can be assured that all of your paragraphs in your brief are correctly formatted. Suppose, however, that after you've done all this work, you decide that you want to change the formatting for a certain set of paragraphs. This is incredibly easy. 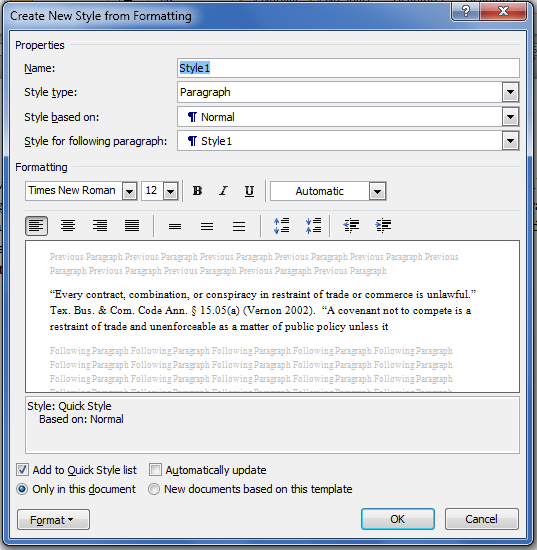 Modify your style and all of the paragraphs based on that style are automatically updated. As an example let's say you decide that you want your Body Text paragraphs to be 14-point font instead of 13-point. 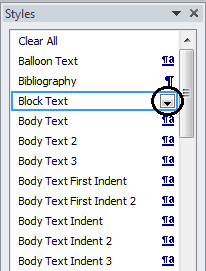 Move your mouse over the Body Text style in the style pane, and click on the drop-down. Select "Modify..."
For the font size, just click on the font size drop-down and select (or type in) the correct size. Once you click okay, the change is applied to all of your Body Text paragraphs. It is beyond the scope of this article to discuss all of the formatting options. But a few are worth noting. Look at the "Style based on" option. If you have two styles that are close to each other with just a few modifications, you can make one based on the other. For example, you can make "Body Text No Indent" based on "Body Text." 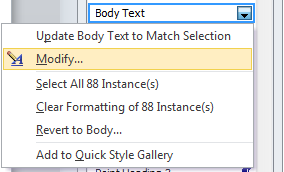 If you do that, any updates you make in Body Text will also appear in Body Text No Indent. That can be both good and bad. So if other styles are changing inexplicably, this may be why. Here's one I find particularly fun. Look at "Style for following paragraph." Nine times out of ten, when I use a block quote, it's only one paragraph long. So, in my Block Text style, I set "Style for following paragraph" to Body Text No Indent. Then for Body Text No Indent, the following paragraph is set to Body Text. Now, when I'm done typing in my block quote and I press enter, Word automatically switches the style for the next paragraph to Body Text No Indent. Once I've typed in my accompanying citation and any other following thoughts, I hit enter again. When I do, Word automatically switches the next paragraph to Body Text. It may not sound like much, but it's one more way you can spend your time focusing on the substance of your brief and less time on the formatting. Finally, it's worth your time to click on the "Format" button on the bottom left. Spend some time figuring out what the various options are. It is well worth your time. The "Paragraph..." option in particular has a lot of good options worth being familiar with. One setting under the paragraph option, however, deserves special mention. Click "Paragraph..." from the "Format" button. Click on the "Line and Page Breaks" tab on the new pop-up. See the "Keep with next" option? That will make sure that the paragraph for the current style (such as a heading) will stay on the same page as the paragraph following it. Once you apply that option to your headings, you will not have to worry about headings appearing at the bottom of the page without any accompanying text beneath it. If you write particularly lengthy headings, you might keep note of "Keep lines together" to prevent a heading from being split onto separate pages. If you're more of a visual person and want to make changes to your style, select the paragraph that will be your guinea pig, make the changes, select the drop-down for the style you want to update, and click on "Update [style name] to Match Selection." Again, the changes will be made to all paragraphs based on that style. Once you have set up your file with all of the appropriate styles, you can use it for all your future briefs. You can do the same for motions and any other type of document you regularly create. You can delete your text without fear of losing your styles. If your styles do disappear, it's probably because you have "Select styles to show" set to "In use" under the options in the style pane. Change that to "In current document," and your styles will still be there. As I said at the beginning, you can never learn how to automate typing in your citations and marking them for a table of authorities without suffering too greatly. To me, however, styles are critical for making a brief look well put together. Give it a try, and I expect you will reach the same conclusion. 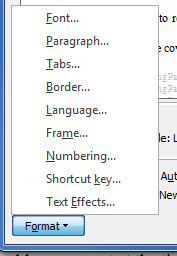 Next column: Using headings with styles in Word. I know I said that this article would be my last how-to for MS Word for a while. That was before I realized that discussing creating and using heading styles properly necessitated its own article.